Rain's Garden: Three Colour Challenge - Spring Garden - Comfort Food!! Three Colour Challenge - Spring Garden - Comfort Food!! Hi Everyone! Today for Michael's Scribble Picnic, the theme is a Three Colour Challenge. I decided to aggravate challenge myself for this watercolour idea I had. 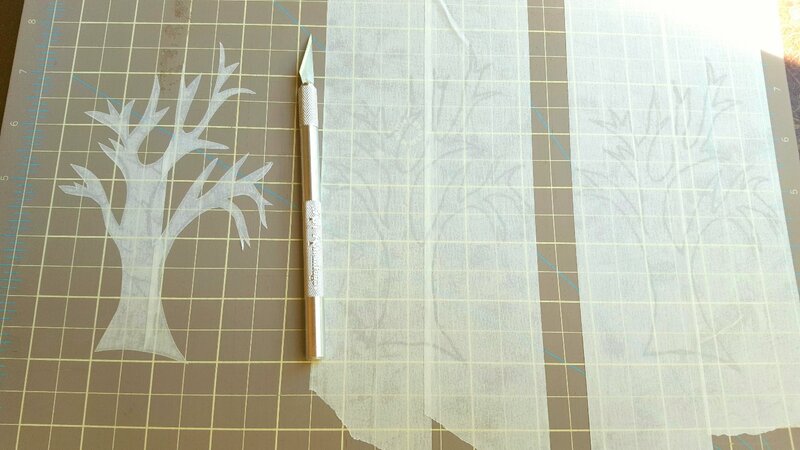 I pulled out my roll of masking tape, sketched some trees on the tape and Exacto'd out the shape. I think I pulled several muscles in my hands and arms doing this lol... It wasn't as easy as I thought it would be, the tape kept tearing and curling, but I managed to get it on the watercolour paper to do my painting! Might I say...never again? :) Well, maybe but not with such detailed objects! 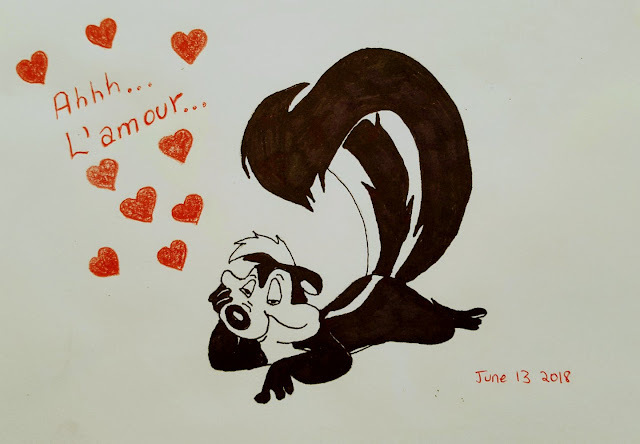 Aah...Pepé Le Pew...a romantic little stinker with love on the brain! This is my three colour piece for my drawing contribution! :) If you'd like to see other people's lovely art, follow the link above! Porch life. The porch is tiny but usually all 6 pets can fit while I'm sitting on my love seat! One dog and one cat is missing from this photo, but they were just inside on the rug by the door, keeping cool. We had about 4 days of hot and humid summery weather at the beginning of June, then spring decided to arrive with hot days and cooler nights. That works for me since Alex and I have decided to try to live without air conditioning this summer. I may regret that in July! The spring garden...soon to be summer garden...is growing nicely! I love how the world turned green almost overnight! The Jungle. Every year we have a plethora (I love using that word!) of ferns that pop up and give us a nice privacy hedge of sorts. It's really nice. 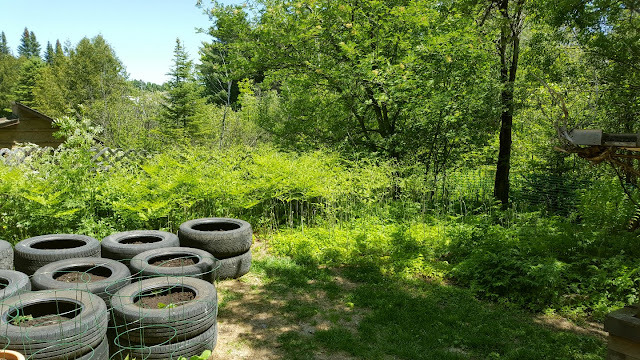 :) And the potatoes are really doing well in the tires! I've "hilled" them to the brim with soil so now I just have to wait until they push through the soil, flower and can be harvested! I've been growing all of my lettuce inside but this is the first pot that's nearly ready to harvest that I planted in late May. 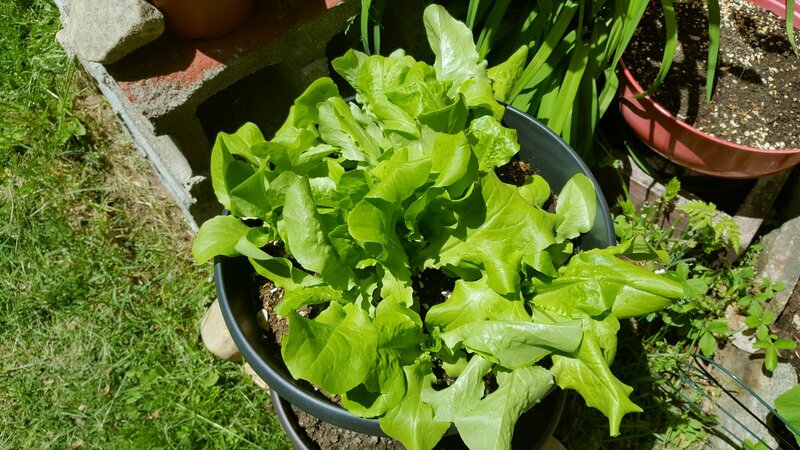 We've been eating a lot of salad lately, it's wonderful! I hope everyone is enjoying life! My posts will be here and there while I enjoy every moment I can of our very short spring and summer! 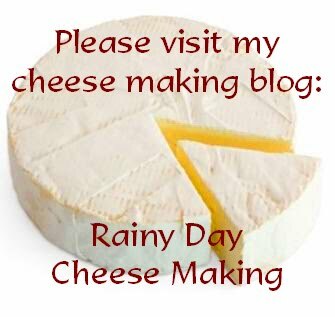 I'm going to spend some time this week catching up with my Blogger friends too! :) Thanks for stopping by! Hi Rain, so glad you visited.. I am loving your delicious cooking and wonderful gardening adventures. Cheers! What a lovely life you have mapped out for yourself, Rain. Wishing you the best. Your Pepe le Pew is right on the money! What a tail! Enjoy your sunny weather in your green paradise! You never cease to amaze dear Rain!!! Your art is fabulous today - and always - and your garden is really starting to look fantastic. What a great summer of eating ahead and much of it from what's growing right outside the door - almost puts a French potager to shame, and makes my own little veggie patch look sad! 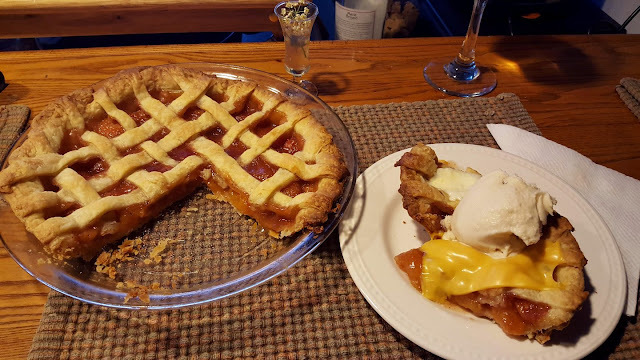 That's a wonderful peach pie BTW - and homemade ice cream, yummy! Happy week, hope the sun shines on you, Alex and the cuties. You are brave to forego a/c - we are expecting 93F here by Sunday which is Father's Day - a lot of sweaty dads will be celebrated! A slice of cheese on pie with ice cream. Hmm. Is that good? I think I gained four pounds just reading your post! Your garden looks amazing, Rain! Good luck with out any A/C. If you might need it anywhere, it would be in bedroom, to sleep at night. Not even there??? How does your garden grow? Wonderfully. Have to look up that "poutine" as I'm not familiar with it. You roll out the pie crust, in a big round. Put the fruit mixture in it. "Fold" the "edges" over the fruit mixture. And bake it that way. And it just looks different from the same pies, I always make. Just for fun!!!!! Enjoy your Spring/Summer!!! It doesn't last that long!!! look at your garden!!! wow! the pets on the porch are so cute! and your poutine...fantastic! what's better than a good poutine? My son asked when we're putting in the air conditioners (since we've had waaaay too many days in the 90s this 'spring') and I said when it doesn't cool down at night. I'm inpired to go out and take garden pictures! I stopped in my tracks when I saw your fabulous garden! Oh.my.goodness. It is amazing! Potatoes in tires! Ingenious! I love it all! 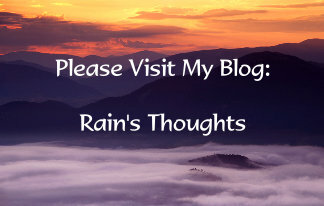 Dear Rain, thank you so much for your comment, on my blog! Love your creative 3 colour pieces!! Ah summer, bring it on! Your food looks yummy. Love what you did with the masks for Scribble Pincic's intriguing challenge. Very well done and lovely looking too. It looks so fresh. Thank you. And of course, Pepe is perfect for limited colour as you've indeed shown here. I know this wasn't an easy challenge and am wondering how many will even attempt it but so glad at least some of your are up to the challenge. I had difficult news yesterday so needless to say, still need to work up my piece. Two ideas in mind currently. Now I am hungry. Pepe LePew is an old favorite. What a great post of fun art, beloved pets, a thriving garden, and some good grub. Thanks for the zipper pouch love. Zippers used to be very intimidating to me and I've had my share of ripping out seams there, but now it's better. If I run into trouble it'll be because of the fabric and trying to figure out the best thread tension. Oh my goodness, Rain. I feel like I put on ten pounds just looking at those pictures of your delicious food. 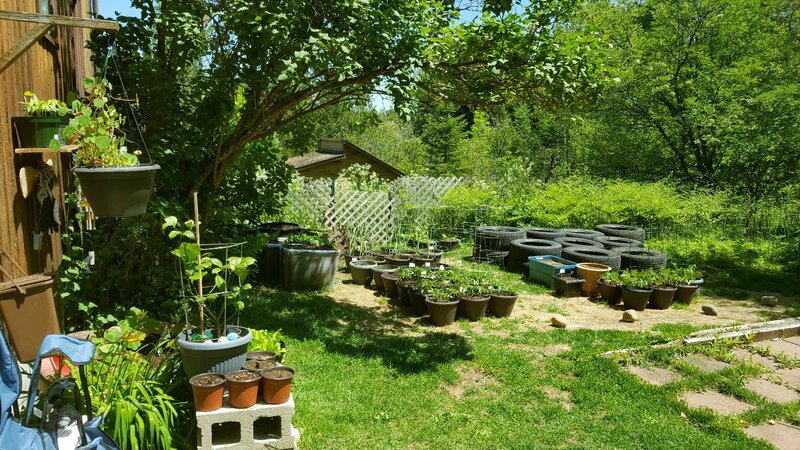 And my how your garden does grow. It will really take off now that it's getting hot. I love your trio of trees. The masking may have been a chore but they really did come out well. Your garden looks so refreshing. The older I get the more I need the air-conditioning. Good luck with your goal on that. The trees are quite nice. I love your idea for growing potatoes and I am excited to see how they turn out, I just might be stealing that idea next year. Your garden and yard is so lush and green . . . I am always striving for lush but in our desert climate it's hard to achieve. If I lived closer I just might surprise you and pop over for a slice of that yummy peach pie. It has been years since I've had peach pie. Keep enjoying life, sweet friend. 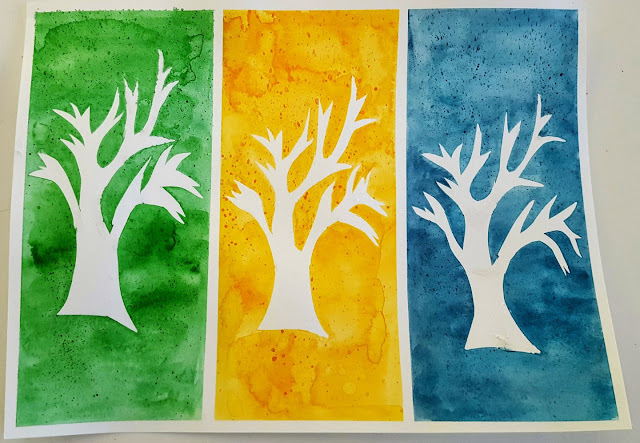 Even though you said it was a pain to create, I think your trees in three colors is stunning! your three season and three color paintings are perfect!!! It's funny you said that the greenness just seemed to pop up because I said the very same thing today!! 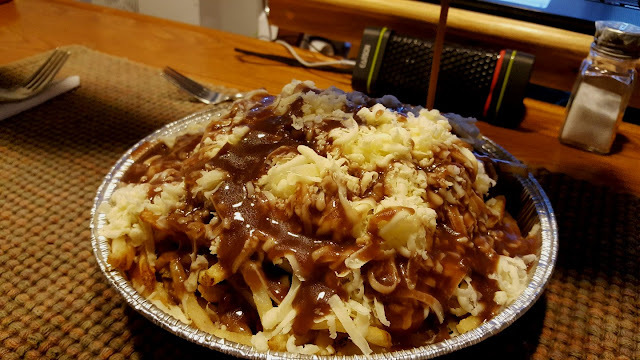 !I guess thats Canadian living at its best,,that poutine makes me very hungry, I think you aced that one, and the pie and the icecream,, wow, what a meal!! Your tree watercolours is so pretty! Love Pepe Le Pew! LOL! Give your fur babies hugs from me! Your garden is amazing! Wow! My mouth is watering over your poutine and peach pie! Seriously, my mouth is watering! LOL! That pie looks delicious. It's been too hot to cook here lately, or even do anything outside. That poutine and your pie look sooo yummy! Hi Rain, glad to see you’re as artistic as ever. I loved your Trees in Season! I think it would look striking framed! Your garden and yard are now so lush and green. I can't wait to see how your potatoes turn out. I think I spotted a French fry or two under that mound of gravy and cheese. I bet it your poutine was delicious. And the peach pie! I'm trying to lose weight, so I can only enjoy such treats vicariously. 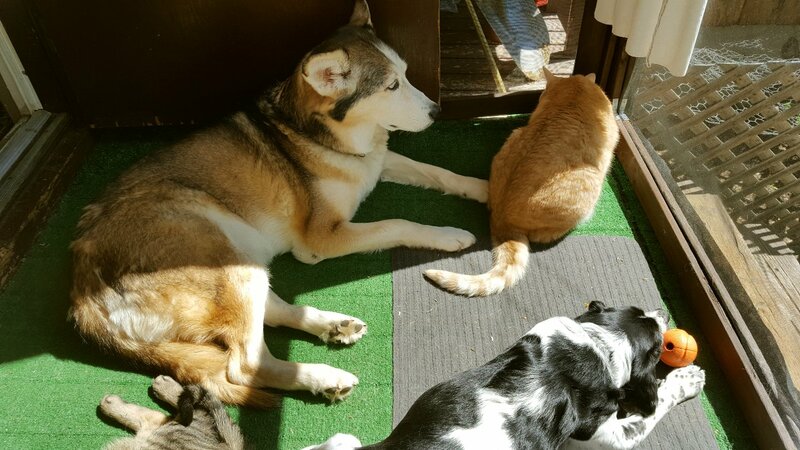 Best of all though was the photo of your critters lounging on the porch. Animals so know how to relax! We try to get through the summer without our air-conditioning, but we caved the other day when it hit 96 inside and was muggy. It's been lovely and cool today. I know how brief the summer is in your area ~ enjoy every beautiful minute! Oh my gosh. Love this post and everything you pack in it. You have a most wonderful spirit, Rain. 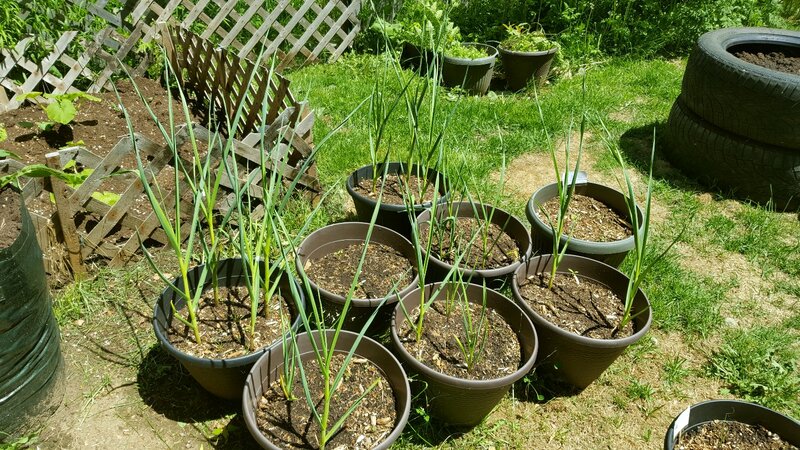 I really need to plant garlic this fall. Are u harvesting it already ? I bet it is soooo good !! !